I've been having fun trying out new wrap styles with different shapes and sizes of scarves, but my go-to favorite is the giant square scarf. It's super easy to turn into a vintage style wrap, and they're often made of light, breezy materials that are perfect for the warmer weather we're now experiencing in the Northern Hemisphere. But let's move beyond the easy-to-find floral vintage ones and find some statement scarves, shall we? Modern square scarves are in great condition, and you don't need to worry about them as much as you may vintage ones, especially the silk ones. I also consider them special pieces that I, personally, would spend more money on than the vintage florals I typically thrift. The vintage scarves we thrift now were once pricier, and I'd love to add unique, quality scarves to my collection that will last as long as those have! Now, kids, this is what we call "wearable art," and it deserves the higher price tag. The scarf is a print of beaded pieces made by the artist. It's 100% silk satin and has the hand-rolled hems that we vintage lovers adore! Hello! It's a TEA scarf! Need I say much more?! 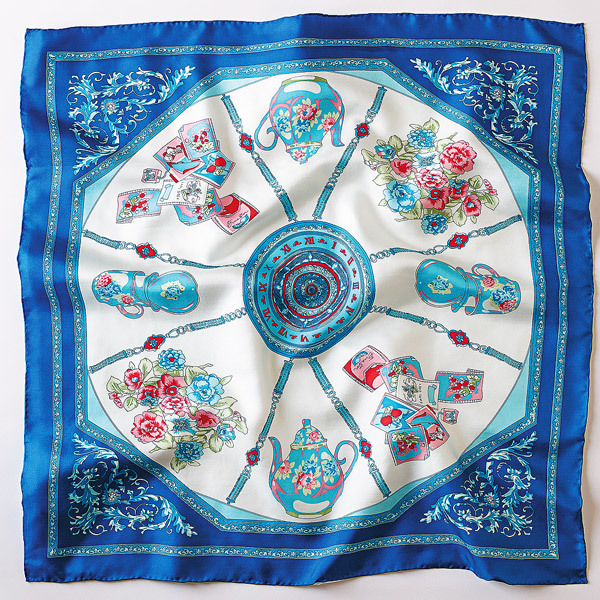 This 100% silk scarf has tea pots, flowers, and tea bags surrounding a Roman numeral clock with a definite vintage vibe. I don't know about you, but I definitely love tea enough to wear it as an accessory. It doesn't get better than this! 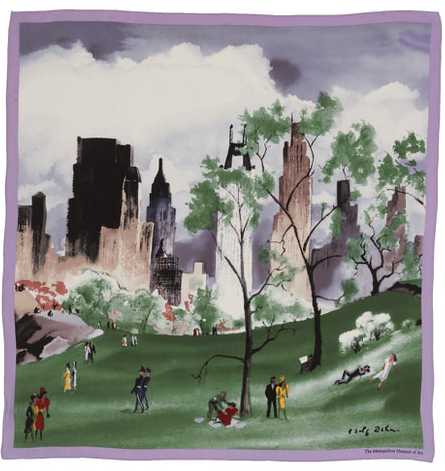 This silk crepe de chine scarf is a print of a 1941 watercolor by artist Adolf Dehn. It features iconic New York architecture and ladies in fantastic hats going for a stroll in Central Park. This is another gorgeous wearable art piece. Featuring eagle and flicker feathers surrounding a beaded motif, this 100% silk satin scarf would be an amazing, culturally-sensitive accessory that would go perfectly with vintage Western looks. There are ways to wear feathered head coverings and support the Native community, and this is it! I include this scarf not as much for its aesthetic appeal (though some people like orange) as much as for the opportunity to be a part of something awesome. With a $100 donation to the creation of the National Women's History Museum, you'd be a part of establishing the first women's museum in any nation's capital. It's time our story was told, right ladies?! 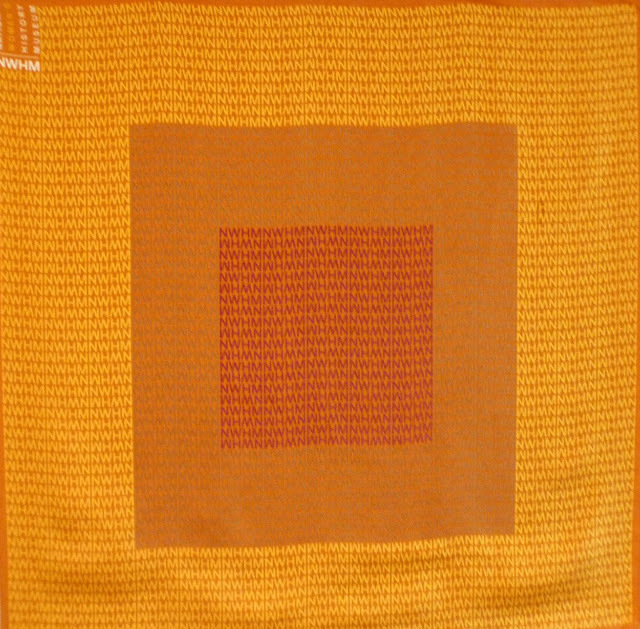 Smith offers several 36"x36" scarves in her shop, and her painterly style uses bold, bright colors in unique designs. This one was one of my favorites, and you have the option of choosing which fabric it is printed on. Think of how many outfits this bright scarf could coordinate with! Okay, so with a price tag like that, this one is mostly for drooling over and staring at online. 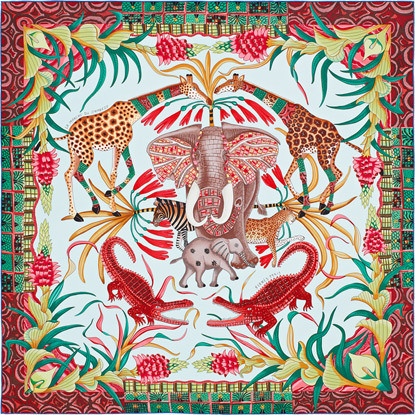 However, I thought it was especially awesome because it's part of a line of scarves formed out of a collaboration between Hermes and a South African art collective called Ardmore. 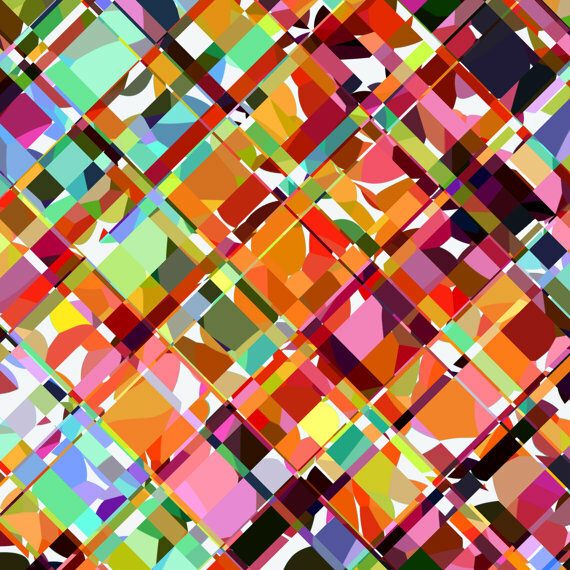 The artists reinvent traditional styles, and scarves like this are the result! Pretty cool, huh? This awesome print is made of vintage postcards included in The Traveler's Eye: Scenes from Asia exhibit. It has handwriting, stamps, postage marks, and hand-tinted scenes found on the old postcards in the collection. It's 100% silk and comes with a museum provenance card! 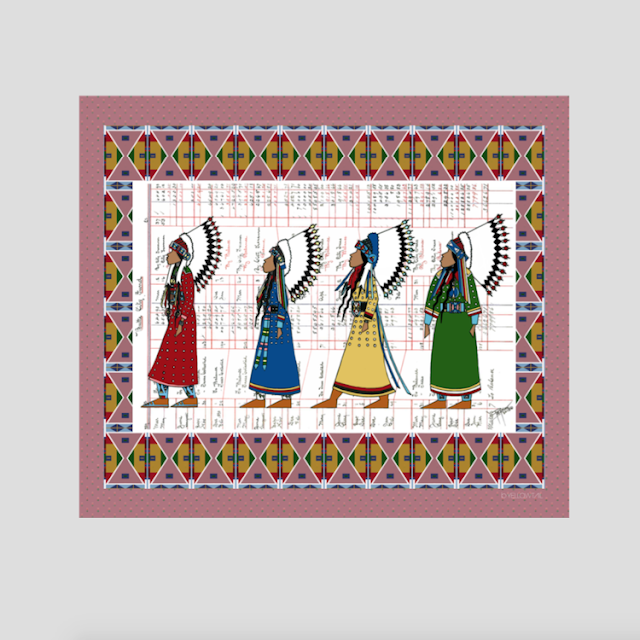 This scarf commemorates a Shoshone warbonnet dance, the only time when females don the traditional warbonnet in Plains cultures. 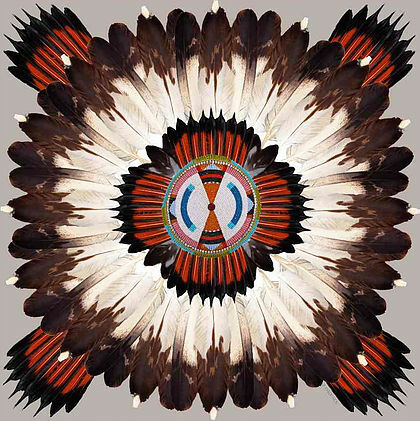 The print is a collaboration with Native artist John Pepion and honors the young leaders of their indigenous nations. It's 100% chiffon and is made in the U.S.A.! So which one is your favorite? If money were no object, which would you pick? Do you have any other favorite modern scarf sources? I have not been compensated for including any of these scarves. I just thought they were awesome and wanted you to see! Exciting and very appealing selection. 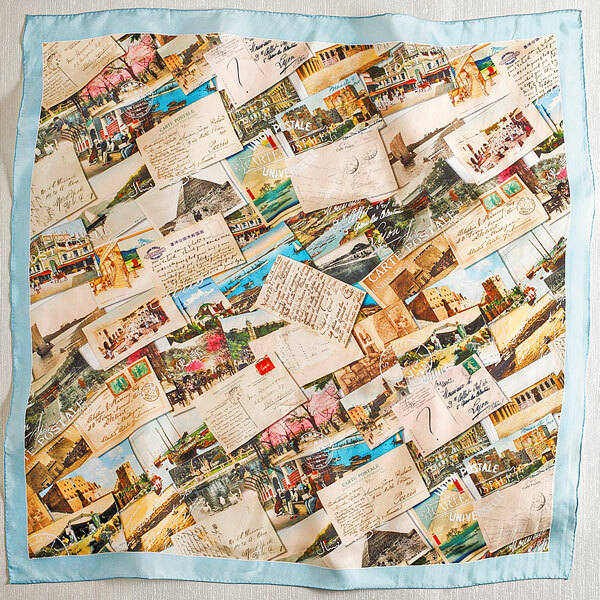 The tea and postcard themed ones - novelty print lover that I am - caught my eye in particular. Thank you for sharing each of these marvelous works of wearable art with us. Some incredible works of art. Is it weird that the roman numerals are calling to me even more than the tea? Head scarves for maths nerds - now there's a niche market! Haha, that's great! A niche market indeed! Wow these prints are lovely. I love it how you incorporate scarves into your daily wardrobe. Those are all so beautiful! I bought a bunch of tichels from Wrapunzel when they did a trunk show at the Modern Orthodox synagogue in my city last January, and they're all so beautiful. I have strong doubts I'll ever marry (and thus be obligated to cover my hair), but I still enjoy wrapping my hair under them when I'm at a non-Orthodox service, and using them as regular scarves on other days.